A favourite in Jaikuwar Bai’s family, this delicious mithai is best prepared with the Alphonso or Pyari varieties of mango. 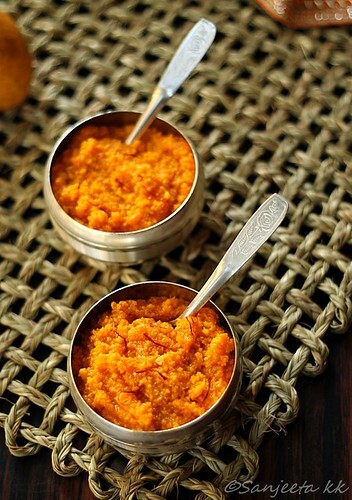 The pulp from these mangoes does not contain any threads and can be used in this recipe without straining. The mangoes must have a sweet-sour flavour since the sourness will allow the milk to curdle. 1. In a thick bottomed pan, bring the milk to a boil. 2. Now add the mango pulp and yogurt, and continue to cook, stirring gently, allowing the milk to curdle. If the mangoes were not sour enough, then ½ cup of yogurt can be added to facilitate curdling. 3. Continue to cook until the entire liquid has evaporated, stirring occasionally to avoid any sticking to the bottom. This may take approx half an hour. 4. Add sugar and continue to cook. If sugar is added before the entire liquid has evaporated, then the liquid tends to splutter. 5. When the sugar has melted completely and the dish starts looking granular, add the saffron and cardamom powder and switch off flame. Cover for 5 minutes, allowing the spice flavours to be absorbed well. 6. Chill and serve in small dessert bowls. This can be refrigerated and used for 3-4 days. Food photography by Sanjeeta of Litebite. This recipe was first published in The Great Granny Diaries – a column in Harmony Magazine. Part-1 of this post is the interview with Jaikuwar Bai Lodha, a Rajasthani great-granny from Ahmednagar, Maharashtra.